With the warm season behind us, most of us in the northern hemisphere are now preparing to enter the cold season. Like our skin, our hair is susceptible to dryness in the cold season due to the lack of moisture in the air. I always find that my hair tends to be very dry in the Fall and it somehow bounces back in the winter time. I guess this makes sense because the hair strands are shocked by the sudden drop in temperature. To relieve my hair from the shock it has been experiencing in the past two weeks, I had to go shopping! The reason is because I know that the products which my hair was introduced to in the summer time would not work, and they actually failed when I managed to use them. For an effective hair therapy, I had to use brand new products and I had to perform a lengthy process which I haven`t done in a long time, just so that my hair could regain some moisture and be healthier afterwards. – I heat up a mixture of castor oil, a teeny bit of Shea butter and few drops of Eucalyptus oil and applied it on my dry hair. I was very careful parting and sectioning my hair so I don`t end up with too much breakage. – I applied the mixture on small sections of hair and twisted them to keep them sectioned. I then covered my head with a plastic wrap and wrapped a cotton sweat shirt around my head to trap in heat. – I left the oils in my hair for about 1 hour. I washed my hair with diluted black soap shampoo by dissolving a small piece of black soap in warm water. I didn`t want my hair to be extra foamy and squeaky clean, so I only washed my hair once. Also, I knew the conditioner in the next step would remove any remaining dirt that was left behind. – I applied Jason Aloe Vera Moisturizing conditioner on each twisted section while paying special attention to the ends of my hair. – I covered my head with the plastic bag and sweater and went about my business for a few hours. I then rinsed the product out of my hair. Results: I noticed that my hair felt cleaner after wash and it felt smooth and soft. This gave me the assurance that the treatment actually worked and my hair has been brought back to life. For my leave-in, I mixed a bit of the conditioner, castor oil and eucalyptus oil and applied the mixture on each twisted section. I sealed the leave-in with castor oil. I then twisted my hair in smaller sections so that it will be stretched for my next style. Moisturizing deep conditioning treatments are crucial during the cold season, as dry hair lacks elasticity and will break easily when handled. It’s also crucial that you use thick products such as Jason conditioner and thicker oils to seal the moisture in. 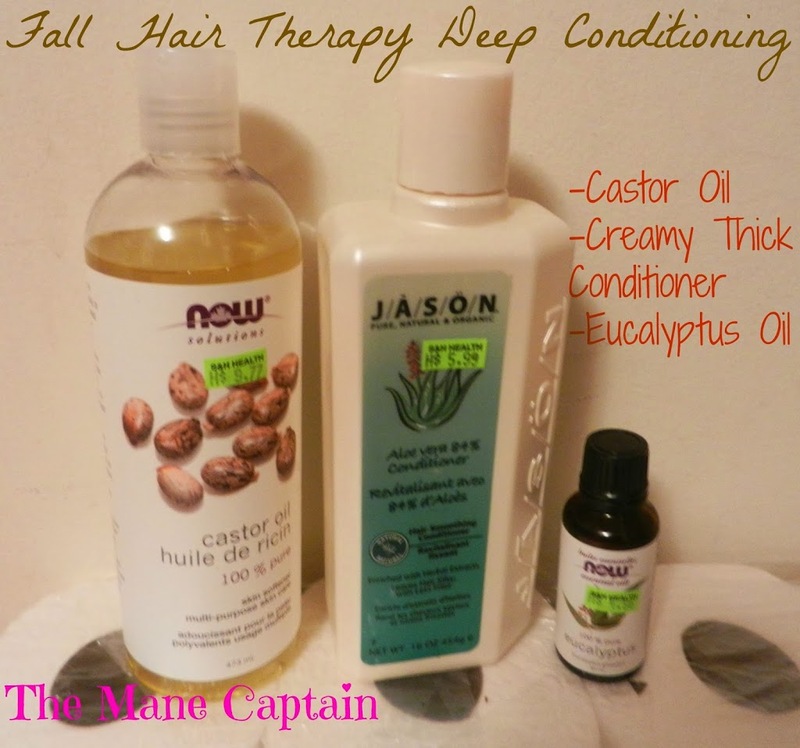 Jason Aloe Vera conditioner ($6), castor oil ($10), and eucalyptus oil ($5) were purchased from S&H Health Foods. You can also get these products from any other health food store or online. Black Soap was purchased from Clore Beauty Supply, though it can also be purchased from any African food store. Hey hunn, love this post because I really needed this. My hair is so dry, it’s horrible. I am wondering where you buy the deep condition from and how much is it? Yea, my hair wasn’t cute too and trust me, I wasn’t happy buying all those products. But desperate times does call for desperate measures and so I had to spend that much time and money on my hair. I’ve updated the post with the product info. Please let me know how your hair therapy went.